Figure 1. B3LYP/def2-TZVP optimized geometry of 1. 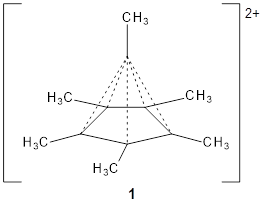 The Wiberg bond order for the bond between the capping carbon and each carbon of the five-member base is about 0.54, so the sum of the bond orders to the apical carbon is less than 4. The carbon is therefore not hypervalent, but it appears to truly be hypercoordinate. (A topological electron density analysis (AIM) study would have been interesting here.) NICS analysis indicates the cage formed by the apical carbon and the five-member ring expresses 3-D aromaticity. This can be thought of as coming from the C5(CH3)5+ fragment with its 4 electrons and the CCH3+ fragment with two electrons, providing 4n + 2 = 6 electrons for the aromatic cage. 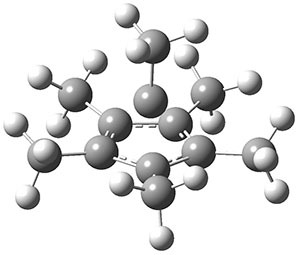 1) Malischewski, M.; Seppelt, K., "Crystal Structure Determination of the Pentagonal-Pyramidal Hexamethylbenzene Dication C6(CH3)62+" Angew. Chem. Int. Ed. 2017, 56, 368-370, DOI: 10.1002/anie.201608795. Re A topological electron density analysis (AIM) study would have been interesting here. Indeed one was done, back in 2009 before the species was characterised by crystallography; see http://www.ch.imperial.ac.uk/rzepa/blog/?p=878/a&gt;.